Chief Gregory Ibe, PhD, is a legendary Nigerian Business Executive, an entrepreneur par excellence, the moving spirit of educational transformation in Nigeria, a philanthropist and humanitarian. He was born on December 10, 1963 in Kaduna where his parents, natives of Uturu, lived then and worked. Although born and brought up outside his parents nativity, Chief Gregory Ibe never ceased to be the quintessence of an Igbo son who is in perfect harmony with the rest of mankind world over. He adores his home place, Uturu, and makes Uturu adorable to the World. He was not born into easy circumstances of life. Indeed, he had a raw deal with poverty in his early life which rather spurred him with the determination to attain great heights today. His tough early life toughened him to complete his primary, secondary and tertiary education, alternating between work and education. That was perhaps nature’s way to prepare him for his future role in Nigeria as the hope for the hopeless. Chief Gregory Ibe’s alma maters include: Boys High School, Ihube, Imo State; School of Accountancy and Management Studies, Aba; Enugu State University of Science and Technology, Enugu; and California Coast University, Santa Ana, CA where he obtained his Master’s Degree in 2003 and Doctorate Degree in Management in 2006. Chief Gregory Ibe is a great name in Nigeria particularly in education. Currently he constitutes the private sector spirit that is shaping science, technology, engineering and mathematics (STEM) education in Nigeria through his involvement in supply of the state-of-the-art teaching/learning equipment with innovative pedagogy in the delivery of the subjects. His intervention is currently transforming the teaching of Science, Technology, Engineering and Mathematics (STEM) in Nigeria at all levels of education. He has implanted entrepreneurship as curricular innovation in education and particularly in Business, Engineering and Technical/Vocational Education. 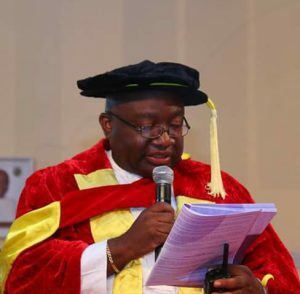 Chief Gregory Ibe has gone further to establish his Private University called Gregory University, Uturu in Abia State, Nigeria with a focus on applied research, entrepreneurship and a Work-Based University Education. His University has the mantra “Knowledge for Tomorrow” . Chief Gregory Ibe has also established Gregory Iyke Foundation as a humanitarian medium to reach out to the poor and the helpless in Nigeria. The Foundation is in affiliation with World Medical Relief Inc. and Global Medical Relief Inc. in the United States for execution of medical aid programmes in Nigeria. Much more are in the hands of Chief Gregory Ibe, PhD to contribute to up-lift humanity, particularly in Nigeria.